A nurse runs a secret, members-only E. R. for criminals. Hotel Artemis is likely to be one of the obscure gems of the summer of 2018. Its a wonderful peanut-butter and chocolate combination of genres: cyberpunk and the Grand Hotel genre. 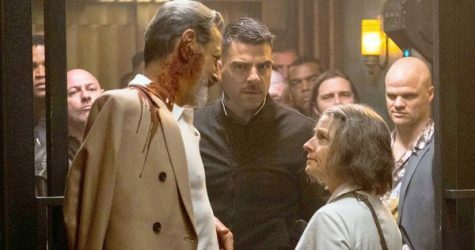 Hotel Artemis is a well acted ensemble piece, nimbly juggling multiple sub-plots and capers, making the most of an enclosed and limited set. 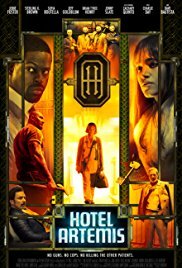 Give us this movie’s Elevator Pitch: Ensemble grand hotel film about a hotel for criminals in a near future cyberpunk dystopia. Who will like this? People that like betrayal filled crime suspense films like Inside Man and Reservoir Dogs, preferably with some added science fiction. Who should skip this?The faint of gut, as this film has a good amount of surgery drama and knife fighting alike. If you don’t like people getting cut open, for good reasons and bad, then you should dodge this film. Elaborate, Please: Hotel Artemis is a premium hotel for professional criminals and spies in a dismal 2028. Its a future comparable to Logan or Strange Days– largely resembling now, but with a few bits of wonder technology. At the Hotel Artemis, wanted felons pay for medical treatment and plastic surgery while they lay low and wait for the heat to die down. But the heat is only building up on this night- LA is being swept by massive riots, one of the guests is there to kill another guest, the police may be on to the operation, and the crime lord who owns the operation is making a visit. This is a Wednesday night for The Nurse (Jodie Foster), who has the role of being both the night manager and the crime doctor, supported only by Everest (Dave Baustista), her orderly/ security guard. Chaos is swirling around outside of the hotel, and conspiracy within. There’s a dapper bank robber on the run (Sterling K. Brown), and mysterious ingenue (Sofia Boutella), a loud mouthed arms dealer (Charlie Day). 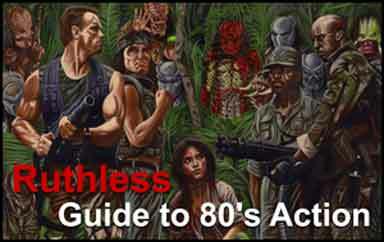 Every character is looking for another place to be, and a score that pays for their exit. Whats a Grand Hotel? Its a sub-genre of film, an ensemble production that takes place within a hotel. Classic examples include the eponymous film, Grand Hotel, 2014s The Grand Budapest Hotel, and Some Like it Hot. Typically, the vignettes and sub-plots of the film range over several genres, allowing a mixture of romance, murder mystery, and screwball comedy. With a Cyberpunk Twist: Cyberpunk is ultimately a genre which weds the moral musings of noir with the speculation of science fiction. However, cyberpunk is a pessimistic deconstruction of the traditional optimism of science fiction- a central idea of cyberpunk is that technology only exacerbates the inequalities and injustices of society, rather than correcting them. Here, even the high-flying bank robbers and hit men are still trapped by technology- needing their proceeds to afford 3-d printed replacement organs and cybernetic eyes. But the technology is ultimately the toppings to this film; lasers instead of drills, holograms instead of telegrams. The real question is which characters will manage to limp out from the gauntlet of cops, angry mobsters, and rioters. Strong points: The casting is strong for every part in this story. Particular plaudits to Sterling K. Brown and Jodie Foster. Weak Links: None really. The film keeps light and lean and sinewy, moving rapidly along with the mousetrap of cascading heists and hits. At an hour and a half, the film doesn’t really slow down to soak in the atmosphere, and we get only the scantiest of beats for each character arc. That being said, what is there is great. 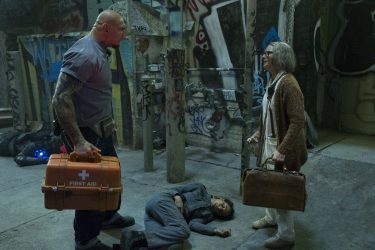 Legacy of the film: Like District 9 or Seven Psychopaths, Hotel Artemis is a difficult film to pitch to a mass audience, but a great and highly enjoyable patch of film for anybody who likes fast moving noir and crime. I suspect that this film will be a perennial on recommendations for midnight movies for sci-fi and noir fans alike.